Morning y’all! How have you been keeping in your neck of woods. It’s apocalypse here in Mumbai: I have a feeling we will have to buy rafts and start tying our things, going by the way its raining. We woke up at 5:45, had our breakfast but couldn’t step out. 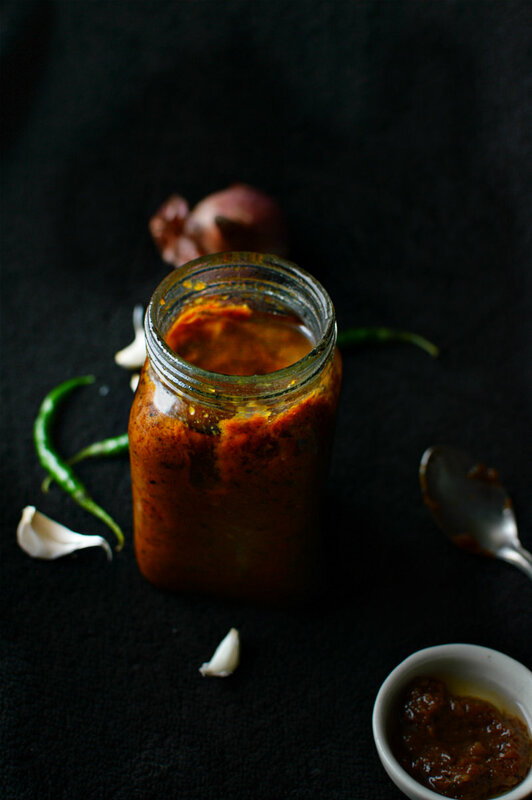 While the husband got a little irked and went off to catch up on his lost sleep, here I am sipping a cuppa and blogging to you about my fiery, red pepper & sweet chili chutney recipe. It’s a grey, dull day and thought a bit of zing-zang would be good for the eyes and the taste buds. What do you say? And as i write to you, I hear an ambulance. i am sure someone’s raft is toppled. You know, up from my 9th floor hall, I can see the local trains running. You will not believe the amount of people I see at 5 in the morning. Sometimes I see them wading through waters in between the railway tracks with a bag on their shoulder, perfectly dressed for work. Sometimes I see them walking by the train line as the train falters and stops: They must reach work by 9:30 or they’ll lose half day’s pay. Then there are daily motorbike commuters whose entire monsoon is divided between wearing the rain coat and taking it off: Yes, Mumbai has a peculiar rainfall structure. You might be drenched in a certain place and at certain places it’ll be sunny as Sahara. And while doing this, they must reach by 9:30. I see them taking the wrong side, over the divider, desperately trying to reach work on time, and I am no exception. I feel bad for them, for us. I go in an AC bus or my husband drives me down but at the end of the day, we are all running for that half day’s pay, risking our lives. Is it even worth it? Here you go, see my reluctance and do whatever you want but I am not stepping out. Nor am I letting my loved ones go out in this torrential rain. Work can happen. Instead, I’ll take a pay cut (my office doesn’t cut my pay, they let me work from home) make some chutney, drink tea and watch TV. 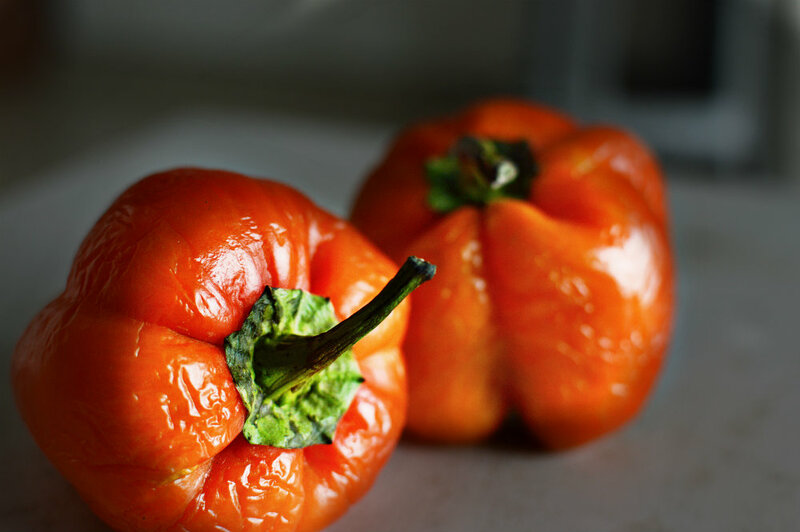 I shall take photographs of insignificant vegetables and try and make them look beautiful. I am going to enjoy this day like a human being is supposed to. Lol, so utterly dramatic. 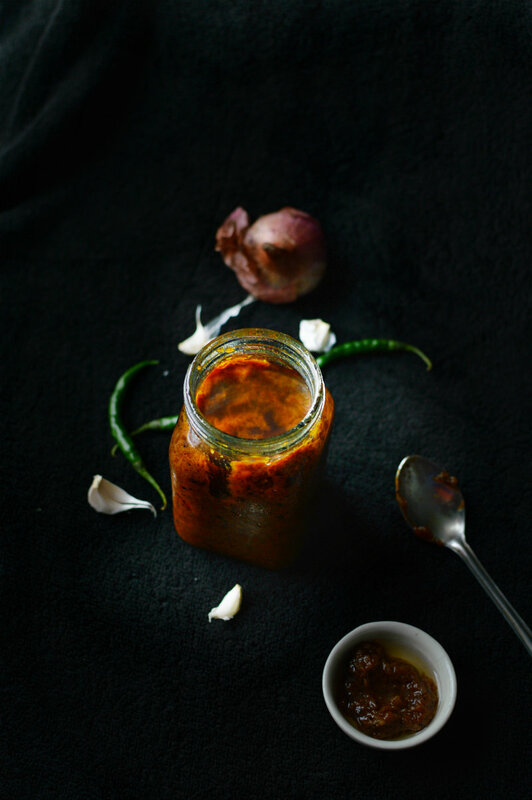 Get back to the roasted red pepper chutney shall we? I bought two green peppers which due to ignorance and intentional avoidance turned bright red. When I took them out yesterday, my husband curtly pointed out how I wasted the peppers and how I have absolutely no regard for things and their soaring prices. Men, I tell you do so little and talk so lofty that it makes me nauseous. It’s all preach and no practice. 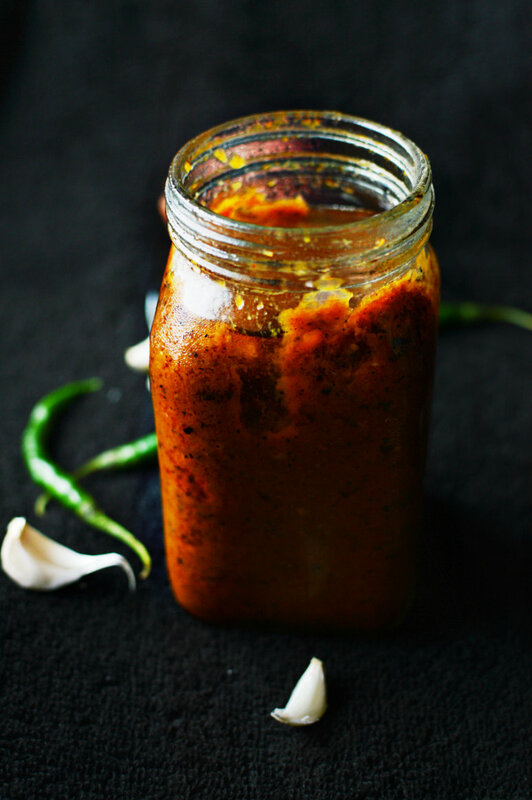 Later in the day when I told him what happened to the “wasted” pepper he shrugged with a ‘hmm’ like making pepper chutney is something I was born to do. Lol, maybe I was and I know that under his ‘hmm’, he really liked the idea. He just won’t show. That’s his dig. We two are like this chutney too: I am very sweet (ROFL, beating one’s own drum doesn’t get any more obnoxious), he is peppery, we are perfect. In a baking tray, add everything except 1/2 cup oil, sugar and vinegar and put to roast. On 120 and about 40 minutes. In a pan, heat 1/2 of the 1/2 cup olive oil and pour the roasted veggies in. At this point, check salt. Add vinegar, sugar and let it cook for about 10 minutes on medium, stirring continuously. Once the mixture has a sauce like consistency, turn the heat off. Add basil and let it cool. In a clean jar, pour your chutney, add half of the olive oil and refrigerate. Slurrp it with dumplings, Flatbread, Paratha or bacon sandwich! I think it seems delicious but alas, I would omit the sugar. I’m just not that sweet! You can. Just omit sugar and make it just savory. Or add jaggery if you want, just a tiny bit. Oh! Okay…here: http://en.wikipedia.org/wiki/Jaggery Weue it a lot as a sugar substitute. Nice lighting there in the photos. !